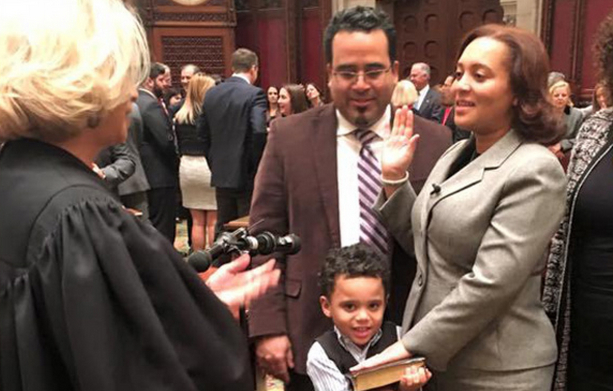 State Senator Marisol Alcántara, who represents Inwood, Washington Heights and parts of the West Side, is wrapping up her first term in office, and it’s promising to be a demanding year. Her district is facing a rezoning, the state is facing a budget crunch, and as a member of the embattled Independent Democratic Conference, she’s facing a challenger in the 2018 elections. Alcántara, a former labor organizer, is a self-described progressive, but during her 2016 campaign for the 31st district she announced her intention to join the IDC, a breakaway group that shares power with the Republicans in the State Senate. That power-sharing coalition, which leaves Democrats in the Senate minority, allows IDC members more say on the budget, what bills get to the floor, and perks like higher-paying committee leadership positions. The IDC describes itself as a coalition that passes progressive bills by working in a bipartisan fashion with Republicans, but critics say that the IDC empowers Republicans, preventing other progressive legislation and budget proposals from being considered. In 2016, Alcantara won 33 percent of the vote in a contested primary in which former councilmember Robert Jackson, her current challenger, came in third with about 500 fewer votes. Some progressives hailed her victory, which made her the only Latina member of the Senate at the time. But Alcántara has also become the target of anti-IDC protests by her constituents, as well as the target of a campaign by the Real Rent Reform Coalition, which has used postcards, Christmas caroling and door-to-door canvassing to pressure the senator to make the passage of three key rent regulations an IDC priority. Foremost on many constituents’ minds is the proposed Inwood rezoning, which in January entered the seven-month public review process through which a rezoning is ultimately approved or disproved. The initiative, invited by local councilmember Ydanis Rodriguez and crafted by the de Blasio administration’s Economic Development Corporation, would spur commercial and housing development in Inwood, including a portion of income-targeted housing, but faces a great deal of local controversy. We send her a detailed list of questions on the rezoning, the budget, the IDC and her upcoming election, then sat down with her on Thursday to hear her answers to those questions and others. Here’s a lightly edited transcript of the recording, along with some context for her remarks. City Limits: Tell me what you’re thinking right now about the Inwood rezoning proposal that’s just been certified? Alcántara: Well, the proposals have some serious issues. The [Area Median Income] that they took into consideration—the EDC—it includes the New York metropolitan area which includes Bergen County, Westchester, it includes very wealthy suburbs of Connecticut like Fairfield County. So if you take that into account, the people of Inwood, especially this side of Broadway, don’t make not even nearly that amount of money. So we had hoped that the EDC was going to do a neighborhood analysis and see what the average income of folks living in Inwood is, and that they would develop housing based on that. Context: EDC is well aware that the median income in Inwood is only $41,687 (as compared to the NYC metropolitan Area Median Income, which is $85,900). The real issue, which Alcántara alludes to, is that under the mayor’s mandatory inclusionary housing policy, a rezoning will create housing that is mostly market rate with a portion for families making between 40 to 80 percent of Area Median Income, or $34,360 to $68,720 for a family of three. While the city says it can provide subsidies to landlords who are willing to provide more units for low-income families, there are no guarantees this will be the case on private sites. City Limits: …In East Harlem, … there were instances where the city put money into public land to reach deeper [low incomes], and then they said that they would work with private developers to try to get some to sponsor more low-income housing, but it wasn’t totally clear when the rezoning passed how much would end up being for low-income. …What do you think the city could do specifically before you would feel more comfortable with [an Inwood rezoning]? Alcántara: They didn’t do a complete study of Inwood. For example, the document is about 400-something pages. And in that, it doesn’t address the issue of transportation. Our train stations are old and this part of Inwood is elevated, so if you are disabled or pregnant or a senior citizen, there was no study done on how that is going to affect [you]. Because these trains, you have to take the stairs that are sometimes like the equivalent of going up [to] a fifth floor apartment. They are planning to develop near the river. A lot of that area was flooded during Sandy. There was not an environmental impact [analysis] on what happens if we have another Sandy, how many folks would be displaced. According to the city, only 500 people will directly be impacted by the rezoning, because they said that only 500 people live in that little space where the rezoning would take place by St. Jude’s church … in the entire 10th Avenue area. So the city did not take into account the domino effect development in that area could have in the rest of Inwood and Washington Heights. What would it do? Would it increase rent prices, for example? They allege that they provided legal assistance to some community groups … one of those groups is Manhattan Legal Services. They could only provide services to one ZIP code. What happens to the rest of Inwood and the rest of Washington Heights? City Limits:… Some people have said that they would like to see some development of housing and commercial establishments east of 10th avenue but are especially concerned about rezoning Dyckman and Broadway and 207th Street. I know there are people concerned about rezoning east of 10th Avenue as well … What do you think? Are there particular areas of the neighborhood that are more vulnerable than others? Alcántara: No, I think the whole neighborhood is vulnerable. This is supposed to be an immigrant neighborhood. For some people, this is the only place they have lived since they arrived in the United States so you have people that have lived in their apartment 30, 40 years that don’t know any other part of the city besides Inwood and Washington Heights. And what would rezoning mean for those folks? Alcántara: Yes, I love the idea of a tech hub … Whether you’re going to be a blue-collar worker or a white-collar worker, you’re going to need to have a knowledge of some kind of technology … We just need more details on how it is going to be implemented, and what are the benefits for the Black and Brown kids that live in northern Manhattan. There are kids that we have that are barely graduating from high school and if they are graduating, they are not going to college. … There are people who just sell things in the street, like a food vendor, there are people who just have a car-washing business. What does it mean for those folks and … can they transition to be in a tech hub like the councilman wants? I think it’s a great idea but I think we need to find more details about it. Alcántara: We saw a letter, an e-mail that was circulated among a group of folks that live here. They said, all the elected officials, all of them are the same. They’re just playing good cop bad cop … I don’t know if it’s hard for people to believe that elected officials of color can disagree on policy issues and that’s what I was referring to. The fact that you’re referring to a bunch of people of color as “these people” and the fact that the people that were doing this doesn’t think that this is a problem. Context: As earlier reported, in September, Alcántara’s office provided City Limits with a copy of an e-mail sent to the listserv of Northern Manhattan Is Not For Sale, a group that has been critical of the rezoning. It accuses Alcántara of participating in a “good cop bad cop” routine. It does not contain the phrase “these people” but does include “We know where they are ALL coming from, THE SAME PLACE!” The recipient of the e-mail told City Limits she was speaking on behalf of herself, not Northern Manhattan Is Not For Sale, that she is a woman of color and that she was referring to the fact that Alcántara, Rodriguez and other elected officials were all members of the local Democratic Club Northern Manhattan Democrats for Change. Following this question, the Senator confirmed that she did have a long relationship with Rodriguez and was formerly his campaign manager, but said that doesn’t mean she has to agree with him on everything. City Limits:: Do you have a position on the Inwood library? So if I meet a parent that was at the library with Literacy Ink and they asked me, “Senator, what is my library going to be at, and what is it going to look like” … I would like to have an answer, I don’t want to say, “it’s going to be a trailer” or maybe I don’t know … And people have a right to know where is the library going to be, what is that library going to look like, and is it going to have some of the same services, and I just don’t think we are getting any of those answers. Context: The city has proposed redeveloping the Inwood library with 100 percent income-targeted housing, a new state of the art library and a pre-K program, and they’ve said they’ll provide a temporary library with “all existing core services.” Still, Alcántara is not alone in her concerns about the lack of details concerning the temporary library. City Limits: … Talking about the upcoming state budget and legislative session … what would you say are some of your priorities? … I’m curious about all your priorities, [and your housing priorities]. Alcántara: I’m sure you are aware that New York State is in a $4.1 billion [actually $4.4 billion] dollar deficit and with that it’s going to affect some of our education, some of our social services. My priority on a statewide level is to push the New York State Card check bill. … We have the highest union density in the country and my Card Check bill will make it easier for state workers to be part of a union and for them to pay their dues to the union. Also Carlos’ Law— … About 84 construction workers have died in the last six years, all of them immigrant workers, some of them are undocumented, building some very pricy real estate in the city and I’m sure that if it had been 80 police officers or 80 firefighters that had died, the state and the city would have taken measures to address those issues. But these are undocumented Latino workers. So we hope we can pass Carlos’ Law that would establish higher fines for construction companies that don’t comply with safety protocol. I also have the Diversity and TV tax credit. Last year it was passed by both the Senate and the Assembly, that would give a $5 million tax credit for TV production companies to hire more minority and women writers, producers and directors. And my last … bill is the surplus food donations act, which would incentivize supermarkets to donate their surplus food to charitable organizations, because you know the food that is not used ends up in landfills and it just adds to more waste and it can have an effect on climate change. And … one out of every six New Yorkers, if I’m not mistaken, suffers from food insecurity. … We hope that this is something that can address both problems, our climate issue and the issue of food insecurity. City Limits: And tell me about some of your housing-related priorities? Alcántara: Last year … we gave funding to Community Voices Heard, which mostly deals with organizing NYCHA residents … Most folks in NYCHA live under conditions that you would probably find in a developing country … So we will continue working with Community Voices Heard. We provided funding to Manhattan Legal Services to provide additional legal support to residents of our district and we hope to expand on that. We also provided funding to Northern Manhattan Improvement Corporation for housing work and we hope to continue providing that. Because like I said, the funding that the city provided them only covers one ZIP code. And we hope that after the budget, we can introduce legislation that deals with tenant harassment. For example, one of my bills that I … acquired from [Congressman Adriano Espaillat] is to increase the penalties that landlords get when they harass tenants. We hope to have all housing documents translated into the seven most commonly used languages which will make it easier for New York State residents when they go to housing court, and we hope this year we can deal with the issue of preferential rent and vacancy decontrol. City Limits: … Some of these pieces of legislation, like preferential rent legislation, vacancy decontrol, are things that you have clearly sponsored … but haven’t gotten to the floor, some would argue because of Republican control of the Senate. What would you say to that criticism that basically the IDC has allowed the Republicans to control the floor? A lot of these bills only have six Democratic co-sponsors; one of them has six, the other one has five. It would be nice if we can get my colleagues to co-sponsor these bills that are already there, so we can begin to bring these issues to the conversation. If my colleagues are so interested in these bills, then they need to sign and be co-sponsors on these bills. And it takes 32 votes to pass everything in the senate … Once we get everybody to sign onto these bills, then we can have a conversation about how to move these bills forward. City Limits: But they would need a Democratic majority to get to the floor, right? City Limits: So tell me about the reunification deal. Do you feel like that’s something that’s going to work out? Alcántara: … It’s something that the state body has put out. I think everyone involved is really excited. Senator Klein and all of us in the IDC and all the mainline Dems are committed to making sure the Democrats are elected to those two seats, the one in the Bronx and the one in Westchester county. City Limits: … Why did you join the IDC to begin with? City Limits: Are there really any differences between the mainline dems and the IDC? City Limits: You’re facing Robert Jackson as a challenger. What’s your best argument to constituents about why you should be reelected? Alcántara: I believe I have done a good job in the Senate. I have brought in millions of dollars in resources to this neighborhood. I have managed to bring resources and services to the upper Manhattan community that we didn’t have before. My opponent has been campaigning for this position I believe like [since] two days after I got elected. I have 100% rating from the New York League of Conservation Voters while my opponent was working for the Styrofoam industry. And I have brought the issue of environmental justice to communities of color, something that is not very popular amongst us. I am a big advocate of congestion pricing, I think we need to do more stuff around the environment. … I used to be on CB9 when my opponent voted for the Manhattanville expansion which wiped businesses away and basically gave a stamp for Columbia University to use eminent domain and wipe [out] many businesses that had been in that community for ages, most of them immigrant owners … We fought very hard against the Manhattanville expansion because we felt that that was the entry door for gentrification and wiping out Black and Brown communities from northern Manhattan. City Limits:… Can I ask you another question about the Inwood rezoning? Of course you don’t get to vote on it. If you had advice for Councilmember Rodriguez going forward, what advice would you give him? Alcántara: … If the city and the state of New York is really committed to diversity and really living up to the reputation of being the progressive city that we are, then we could use the Inwood rezoning as a model community where we can build 100 percent affordable. And when I mean affordable, it’s a place where a police officer can raise his family. It’s a place where a teacher can raise his family. It’s a place where a nurse can raise her family … I highly advise our councilmember that we could use the Inwood rezoning as a model for the rest of the country. Like look, this is our great city of New York, an immigrant city, the city is so committed to building affordable housing that they build 4,000 and something units in Inwood. * * * *A Response from Richard Fife, spokesman for Robert Jackson. Fife did not address Jackson’s role in the Styrofoam industry. These are desperate charges from a failing candidate trying to cover-up a record of joining a rogue group of Democrats—the IDC—who’ve made an alliance with the Trump- supporting Republican minority and real estate developers to keep the Republicans in power. The fact is that while Senator Alcantara and the IDC have blocked all rent reforms and resisted closing landlord loopholes, and she has already taken more money than the Primary legal limit from the Real Estate Board of NY, Robert Jackson sponsored the Small Business Survival Act, has long been involved in Northern Manhattan Is Not for Sale and has been endorsed by Tenants PAC, New York’s leading tenants’ advocate. And Robert Jackson was a leader in initiating a community-based rezoning of the area around Columbia to protect its neighbors from being displaced and achieving a legally enforceable agreement with community residents and stakeholders resulting in a community driven not for profit having access to millions of dollars to promote and protect Harlem community interests, including the creation of two schools. *Correction: Originally said there were 15 sponsors of the preferential bill, 12 sponsors of the vacancy bonus bill and 17 of the vacancy decontrol bill. In fact, that was an overcount and the number of mainline Dem sponsors is closer to what Alcantara surmised, though slightly higher. We regret the error. **Correction: Originally said 10029 instead of the correct zipcode, 10034. ***These paragraphs were added for clarity. Uh huh. We’re done with her. Jackson should have been our choice in 2016, and we’re giving him the seat in 2018. New York State should have no more tolerance for State senators who don’t support the new Reproductive Rights Act and the Child Victims Act, as well as NYC congestion pricing, the decriminalization of marijuana, and other progressive laws. Enough. Out with her. Tenants PAC has endorsed Robert Jackson in the 2018 Democratic primary election and in December 2017 contributed $5,000 to his campaign. A disservice to the community to allow a spokesman to respond on behalf of Jackson and not the candidate himself. Can we sue the IDC for their bait and switch tactics? Alcantara and the other Democrat turncoats all ran as Democrats and then aligned with Republicans. Besides the mixed messages of the Governor, can’t the National Democratic Party just throw these traitors out? I will make it my mission this year to send Alcántara packing in 2018 because she is no progressive. I’ve already talked to my neighbors about her dishonesty as well as distributed flyers about the turncoat IDC; especially in light of the gentrification processes occurring in my Washington Heights neighborhood. And while it’s true that Simcha Felder remains a stumbling block, that doesn’t mean that the Republican-aligned IDC should get a pass this election season; and I also include Cuomo (who engineered the IDC scheme), as a political hack who needs to go. I’m going to add to this, actually, as what she said is not entirely true. Those who went to her campaign town halls might have picked up on the fact that she was going to join the IDC. But to casual voters, Alcantara was presented as the safe choice by her predecessor, Adriano Espaillat, who did not caucus with the IDC. The fact that she worked in his office and was being endorsed by him made her a clear front-runner. Most voters hadn’t heard of the IDC until after Alcantara has won the seat. Alcántara says “I had no institutional support whatsoever, and people who were in the mainline Dems would not even sit down and meet with me.” Translation: they would not give me money for my campaign so I sold out so I could run on Jeff Klein’s (Republican) real estate money. You know that Trump is part of that New York real estate club too. So who are you really, Marisol? You sold out the people of your district, the security of their housing, and everything else you (falsely) say you care about. And all those people who think you represent their cause are being deceived by you, because we all know that what really counts is who controls the agenda. You sold us out to them so you could run for office. Your life is a lie! I also did not know, after substantive research, that Alcantara was going to caucus with the IDC. I didn’t even know who the IDC was until I learned about this issue. I regret voting for her, and we should vote differently this year (I live in her district). Voters in Queens Assembly District Could See a Rarity in September: A Contested Race! For only the second time in a decade, voters in the Assembly district covering parts of the Corona, Elmhurst, and Jackson Heights neighborhoods could see a contested race in the fall, though not in an April special election.